In this series of posts, the dual of the “Unfathomable Bugs” series, I describe interesting bugs that are my own fault. Today’s bug comes courtesy of me. Thanks, self, this series wouldn’t exist without the generous contributions of entities like you. Recently, I had my first foray into tessellating a sphere (computing an approximation of its surface with a set of triangles). Considering I work at a company known for expertise in a development platform for creating 3d games, you might find this surprising. However, unlike my co-workers, my professional background is actually in application development and, although I did create games as a hobby, they were mainly maps/mods for StarCraft (e.g. Storm the Fort) and WarCraft 3 (e.g. Power Towers) instead of stand-alone programs with custom graphics engines. As a result, even though I understand the math behind 3d graphics very well, I haven’t had to solve a lot of the common problems like sphere tessellation. 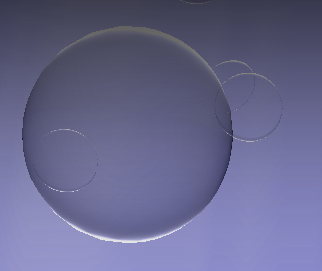 I encountered the sphere tessellation problem as part of optimizing and augmenting bubble-rendering code to allow deformations of the bubbles. After implementing some obvious optimizations, like caching the vertices making up the tessellation instead of constantly recomputing them, I noticed that the tessellation itself could be improved. It was constructed out of points evenly spaced by longitude and latitude. As a result, there were significantly more points near the “poles” than there were near the “equator”. You can see this for yourself if you have a globe of the earth: the areas separated by the latitude and longitude lines are smaller near the poles. I figured that, by constructing a more uniform tessellation, I could cut the number of points by about a quarter while maintaining an equivalent level of detail. 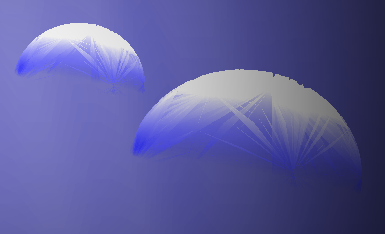 Don't spend too long scouring the code for misplaced vertices, reversed orderings, or memory corruption. It's not that type of bug. Eventually, I mentioned my predicament to a coworker. Intrigued, they reviewed the code and confirmed that it looked right. However, having lots of experience in 3d graphics, they knew about the graphics diagnostics functionality in visual studio 2012 that lets you see what's being drawn in stages. The problem is the refining strategy. Not the code implementing the strategy, but the idea itself. In particular, it never makes any edges shorter. It adds shorter and shorter edges, but the original edges are never replaced. This creates a very cool shape, with a volume that does approximate the volume of a sphere, but with a fractal surface instead of a smooth spherical surface. The computer was doing exactly what I said, but what I said did not imply what I really wanted. While looking for the bug I might as well have been trying to figure out why 2+2 didn't return 5 by confirming there were no arithmetic overflows in the code. This bug was particularly subtle to me, which is a bit embarrassing considering how obvious it is in hindsight. In my defense the bug is not only hiding in the spec, instead of the code, but it only appears after the second iteration of refinement. I simulated the first iteration with pen and paper, but the result is just a cube (a perfectly fine low-quality approximation of a sphere). Also, it's hard to feel bad about making a stupid mistake when you get a neat looking fractal out of it. Maybe someone will find that useful or at least interesting.